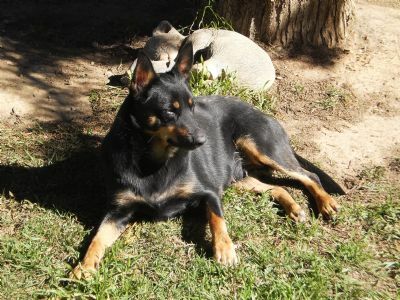 "Jilly Bean" is a lovely black/tan with true correct markings on face, chest bars, legs and stifles even down to the pencil markings on her feet. 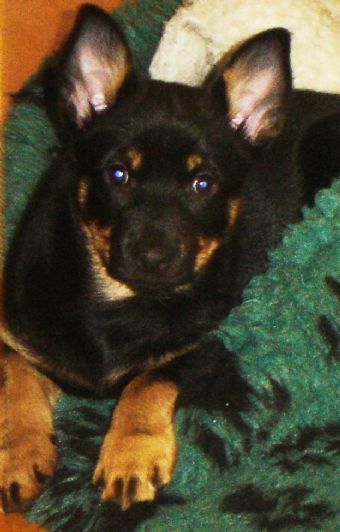 Along with being a true black/tan this little girl has the best temperament and attitude - a bundle of mischief and a true feral!!!!! Loves hugs and lots of affection. "Sally" and "Jet" the sire and dam of "Jilly" both have outstanding temperaments and true sound movement. 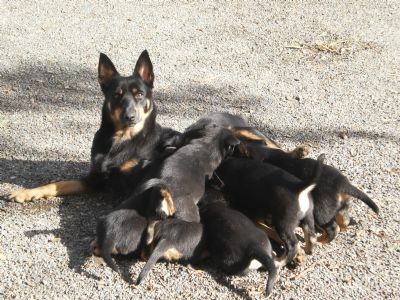 "Jet" has started his herding training and "Sally" has attained her Australian Championship Title with numerous other dogs competing against her along the way. Thank you so much to Cass Finlay of Ringbarka Kelpies for allowing us to use her lovely boy "Jet".